18+ non-funded players only. Offer valid until further notice. Min deposit £10. Max bonus £200. Wagering requirement is 30x (deposit + bonus). Contribution varies by game. Deposit balance is available for withdrawal at any time. General withdrawal restrictions & full T&Cs apply. 18+ non-funded players only. Offer valid until further notice. Min deposit £400. Max bonus £500. Wagering requirement is 30x (deposit + bonus). Contribution varies by game. Deposit balance is available for withdrawal at any time. General withdrawal restrictions & full T&Cs apply. 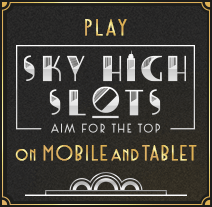 Welcome to Sky High Slots! Discover a selection of over 350 high-quality games! You could spin and win for pennies or aim higher and go for one of our huge progressive jackpots to win big. Play whenever you like on Desktop, Mobile phone or Tablet! If you need any help or information, we’re always here for you!